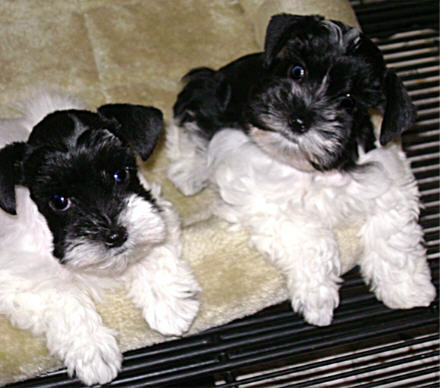 These gorgeous toy and miniature schnauzer puppies, pictured here on the left, are previous puppies that my family of Schnauzers have produced. They are examples of the fine quality of puppy you can expect from Music Makers. 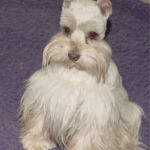 My teacup, toy, and miniature schnauzers are square bodied and stocky built. Square bodied means as tall at the withers to the floor as he/she is long from the withers to the base of the tail. 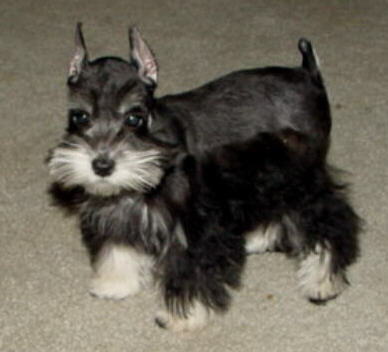 A long bodied, short-legged teacup, toy, or miniature schnauzer puppy is dwarfism. Dwarfism is a genetic defect that is passed on to any future offspring. Your teacup schnauzer should weigh between 3 and 6 pounds when mature. 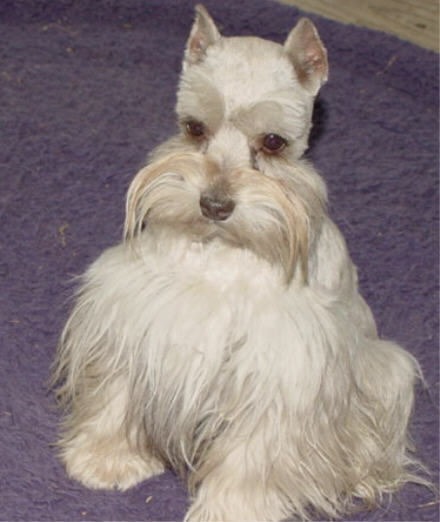 The teacup schnauzer’s growth plate (skeletal structure) stops growing between 7 and 8 months of age. 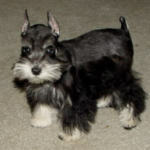 Many of my lines of teacup schnauzers hit their top weight at the age of 6 months. My toy schnauzer matures at approximately 6 to 10 pounds and my miniature schnauzer matures at approximately 11 to 16 pounds. Anything over 16 pounds is a large miniature and I generally don’t have dogs that reach that size. 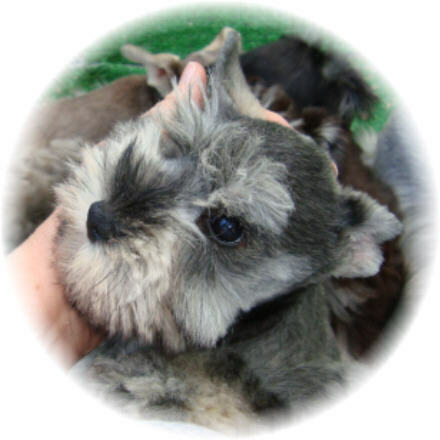 Please check out my MINIATURE SCHNAUZER PUPPIES FOR SALE page for available puppies. MUSIC MAKER’S BLOODLINES HAVE ABSOLUTELY NO MERLE GENETICS. MY DOGS ARE 100% MINIATURE SCHNAUZERS. 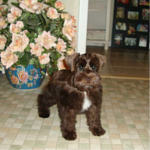 AKC REGISTERED. We specialize in quality toy , teacup, and miniature schnauzers near Houston, Texas. 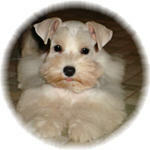 We strive in every way to give you a beautiful healthy pet. 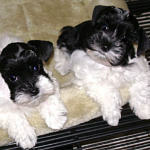 The toy schnauzer comes in several sizes. From as small as two and one half pounds (teacup size) to ten pounds. Under six pounds is considered teacup or micro size. Six to ten pounds is considered the usual size of toy. Fourteen pounds and under are considered a small miniature. and childlike personality and behavior. You cannot find a smarter or more loyal dog for a family pet. 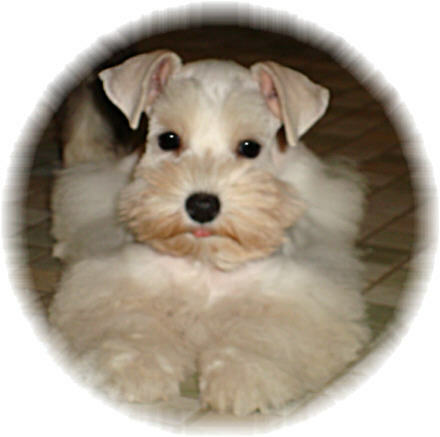 Their non-shedding coat makes them hypo-allergenic. 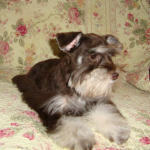 But that also makes them high maintenance, because they need to be groomed on a regular basis. With that said, they need to have an expense account, unless you plan to be the groomer. 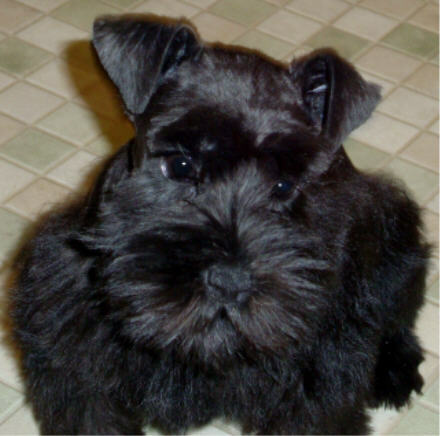 in only one way from the miniature size schnauzer. They only differ in their small stature. They have the same big personality and the same life expectancy. But one thing is for sure, they don't have as much dog to groom. In keeping with that big personality, they are a big dog lover's small dog. are the hardest to fall head over hills. Your man will be in love with someone else. You only thought you were buying this dog for you. 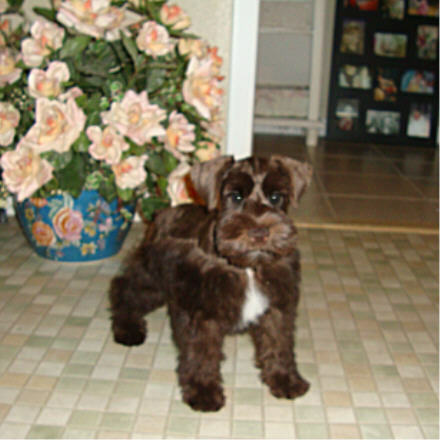 Look on my toy page for more information about the toy schnauzer.